– The automatic brightness at its default settings doesn't adjust to ambient lighting conditions enough. You have to slam the auto brightness offset slider manually to the maximum so it reaches the maximum brightness allowed. It is either a defect of the light sensor of my unit or a bug that may need to be filed. – The amount of internal reflections in the panel is high in today's standards, in no way comparable to an LPTS LCD of the two years old Nexus 5 and its polarized lens generation. – The maximum brightness allowed by the AMOLED panel driver (measured at 366 cd/m² on my unit) is below average nowadays. Most mid-range smartphones reach higher brightness levels. It makes every color but white itself darker than it should, which only reduces legibility further in challenging environmental conditions. Bugs, limited hardware characteristics and inadequate calibration together make up one of the poorest sunlight legibility in today's smartphones on the Nexus 6P. Concretely, it means that if you're used to walk out, exchange message, read articles, you will struggle doing so on the Nexus 6P despite the larger screen. Some of the shortcomings could be addressed to improve the situation. With a comparison between maximum brightness and approx 100 cd/m² in order to evaluate the calibration curves scaling. – The curves, measured with a 256-precision are smooth which indicates the absence of banding in the grayscale. – The color gamut is extremely large, and color saturation is increased further by the higher gamma: as you can see in the CIE 1932 diagrams, the saturation points are not spaced evenly. Visual inspection of http://dl.project-voodoo.org/screen-tests/CIExy1931.png shows color clipping due to the color processing present to increase color saturation. Boosting color saturation on such a wide-gamut display is undesirable. This is the first Nexus AMOLED device boosting color saturation. I wonder if it's intentional or something inherited from the panel supplier default setup. The color saturation levels are so extreme that I would qualify this color rendition behavior as a bug and encourage to file it as such. – On slightly lower brightness levels like measured at 100 cd/m², the shadows on this unit become a lot darker, quickly reaching below the minimum the i1 Display Pro sensor used here can read. – Grayscale RGB levels tracking on this unit is better at 100 cd/m² than at maximum brightness. This is the reverse of older AMOLED brightness scaling I had experience with, where maximum brightness was the most accurate. This may vary between units, but it's worth mentioning that lower brightness levels doesn't necessarily equates to reduced color accuracy. Although this remark is valid for midrange and highlights, the situation tends to degrade in shadows. 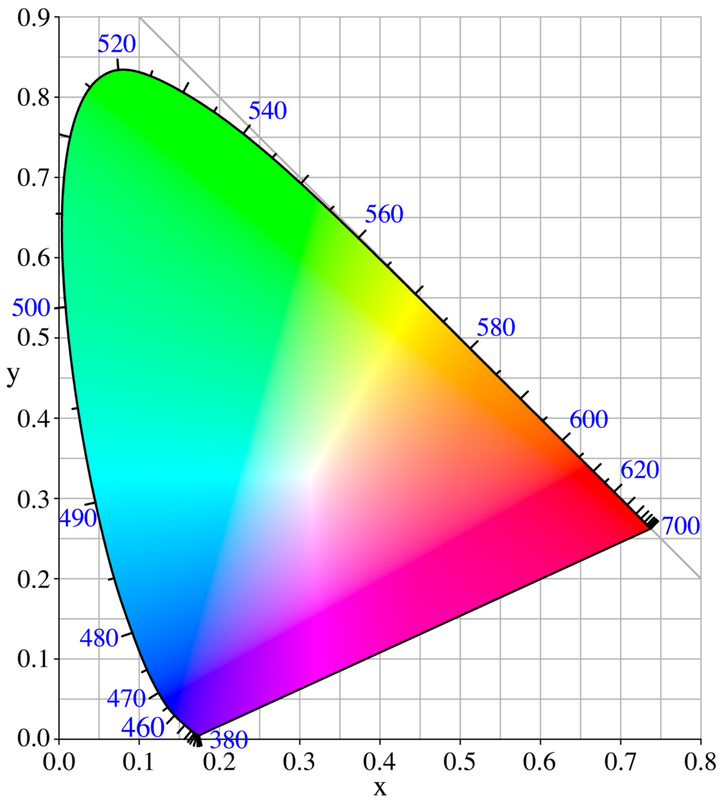 The colorimeter here can't see things exactly like your eyes: a correction would be required due to the AMOLED spectral characteristics but it still gives an idea with red lacking compared blue and green, compared to a standard target of Natural Daylight D65, which is neither yellow, blue or green, nor warm or cold but average daytime neutral white. Since our vision is most sensitive to green, it is apparent. Also since the color temperature formula, giving a warm/cold indication essentially ignored the green component, it is not reflected in the grayscale temperature curves values. The decision (or oversight) to boost color saturation using color processing by default really leaves me perplex.